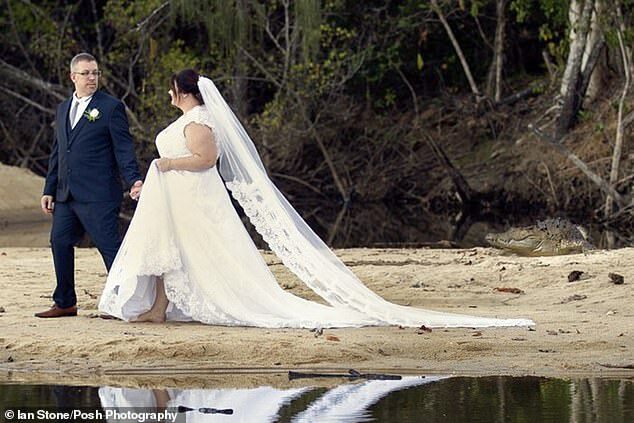 A massive crocodile appears to be sneakily photo-bombing a newlywed’s photo-shoot as they remain unaware of the danger lurking just metres away. However it has since emerged that the huge reptile was a fake and had been cleverly superimposed into the photo. The ‘reptile’ emerged in the background photo of a wedding at Palm Cove, Cairns in Queensland about five weeks ago. The photo, which was taken by Ian Stone for Posh Photography, has been shared on Facebook with some users rightly claiming the image had been tampered with and the crocodile is fake. A couple claiming to be the bridal pair said the photo was altered by the photographer. 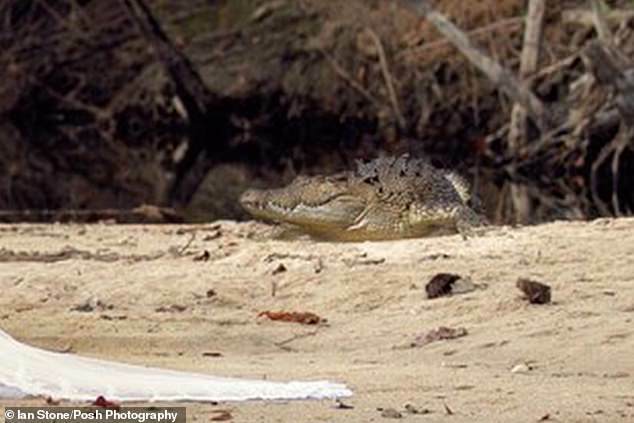 Mr Stone, who works as a photographer in the Palm Cove area, told Daily Mail Australia he had never seen a crocodile while at work never had any worries about the animals. ‘There are no crocodiles in the near vicinity,’ Mr Stone said. ‘There’s more danger having your wedding in a Sydney garden with brown snakes,’ he joked. 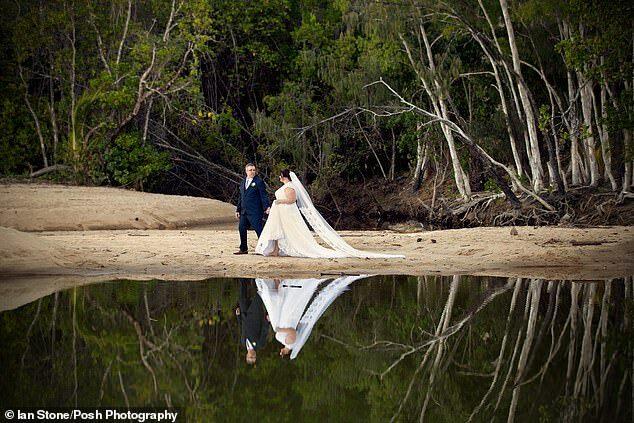 Alice Irvin from South Pacific Bridal who also operate in the area told Daily Mail Australia: ‘In 17 years of conducting weddings at Palm Cove, we have only ever spotted two small crocodiles so it is fairly rare in our experience.